Click for a range map. The Canada Goose is the only goose that nests in Tennessee. It is a year round resident of the state and numbers swell in the winter when resident birds are joined by more northerly nesters. The range of the Canada Goose extends from central Alaska across Canada southward to the central United States, and it winters where there is open water in the lower 48 states. 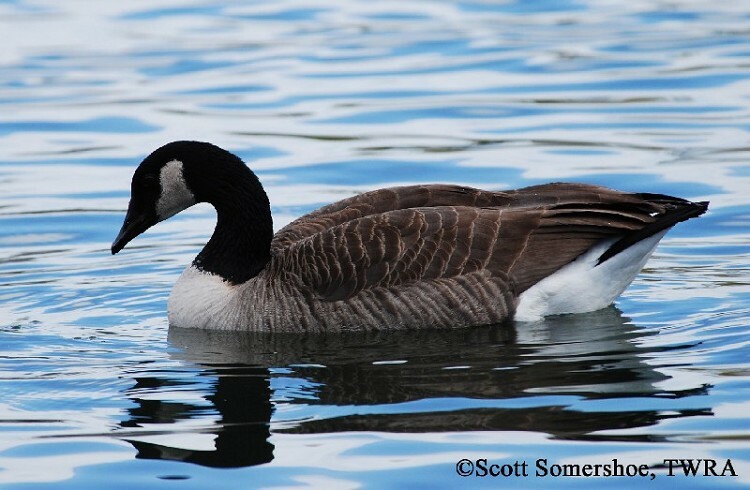 The Canada Goose was extirpated from Tennessee in the late 19th century, but starting in 1966 TWRA, later assisted by TVA, successfully established a non-migratory resident population. This reintroduction was so successful that these geese have become a nuisance in a few parks and golf courses. Description: Males and females are similar in size and appearance. They can be identified by their black heads and necks marked with a contrasting white “chinstrap.” The back is brown, the chest and belly are pale, and the tail is black with a white rump band. Voice: The call is a distinct and musical honking. Mated pairs will often honk back and forth in flight. The smaller, but otherwise almost identical Cackling Goose Branta hutchinsii is best distinguished by its overall smaller body size, smaller triangular shaped bill, and by its voice, which is distinctly higher-pitched. Small numbers of Cackling Geese spend the winter in Tennessee, usually in association with Canada Geese. See the link below for help on separating Canada and Cackling Geese. Habitat: Always found near water, Canada Geese are common in wetlands, city ponds, lakes, lawns, and grassy fields. In winter they often forage on grain in agricultural fields. Diet: Aquatic vegetation, grasses, grains, insects, mollusks, crustaceans, and occasionally small fish. Nesting and reproduction: Canada Geese form long-term pair bonds. Nest building in Tennessee begins in late March or early April. Clutch Size: 4 to 7 eggs, occasionally as many as 10. Incubation: The female alone incubates for 25 to 30 days while the male guards her and the nest. Fledging: Young leave the nest within 2 days of hatching and will stay with the parents into the winter months. Nest: The female selects the nest site and builds the nest of grasses and forbs, and lined with body feathers. It is always placed near water, usually on a slightly elevated site with a fairly unobstructed view. Status in Tennessee: Canada Geese are fairly common nesters in Middle and East Tennessee and rare in West Tennessee. In winter they are most numerous in West Tennessee when the Tennessee population is joined by more northerly nesters. Maximum numbers occur from late November through March, but due to warmer winters fewer Canada Geese winter in Tennessee than in the recent past. Canada Geese were extirpated from Tennessee in the late 1800s. A private individual near Old Hickory Lake in Sumner County started a small captive breeding flock in the 1950s, and TWRA expanded this project in 1966. TWRA's goal was to produce a hunt-able non-migratory population to offset the decreasing numbers of geese wintering in the state. The Old Hickory flock numbered more than 400 birds by 1969, 3,000 by 1977, and had nearly 10,000 birds by 1980. The subspecies that nests in Tennessee is the “Giant” race (Branta Canadensis maxima). In the 1950st this subspecies was considered extinct. However, the discovery of isolated populations in Minnesota in the 1960s and the subsequent intensive reintroduction efforts along the Mississippi Valley Flyway have resulted in the Giant Canada Goose now being widespread and locally abundant, with an estimated 2005 population exceeding 1.5 million birds. Southern populations of B. c. maxima are sedentary whereas northern populations are migratory and winter mostly in the Tennessee and Mississippi valleys. The Canada Geese nesting in Tennessee is indeed non-migratory. Of the 4,568 geese banded between 1967 and 1977, there were only three band recoveries outside the state. Canada Geese are often seen flying in a "V" formation when migrating. Aside from the lead bird, each flies slightly above the bird in front and benefits from reduced wind resistance. Birds take turns being in the lead falling back when they get tired. The Cackling Goose (Branta hutchinsii) was until recently considered the smallest subspecies of the Canada Goose. Best places to see in Tennessee: In winter Canada Geese are found on lakes and large ponds in the middle and western parts of the state including Reelfoot Lake, Cross Creeks NWR, Britton Ford, Tennessee NWR, and Old Hickory Lake. During the breeding season they can be found on lakes and ponds statewide. Mowbray, Thomas B., Craig R. Ely, James S. Sedinger and Robert E. Trost. 2002. Canada Goose (Branta canadensis). The Birds of North America, No. 682 (A. Poole and F. Gill, eds.). The Academy of Natural Sciences, Philadelphia, PA, and The American Ornithologists' Union, Washington, D.C.
Nicholson, C. P. 1997. Atlas of Breeding Birds of Tennessee. Univ. Tennessee Press, Knoxville. Robinson J. C. 1990. An Annotated Checklist of the Birds of Tennessee. Univ. Tennessee Press, Knoxville. Sibley, D. A. 2000. The Sibley Guide to Birds. A. A. Knopf, New York, NY.